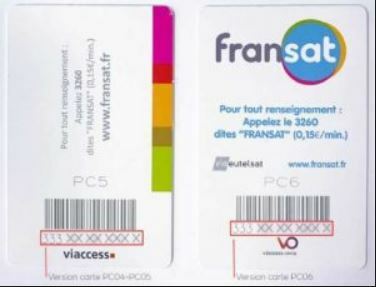 Please check your Fransat Card now! If you have the latest card PC6 no action is required. 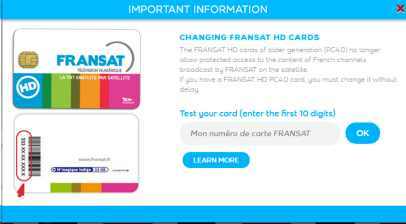 If you have the PC5 Card you need to update to the latest version PC6 before 15th April or you will not be able to view your Fransat channels. The reason for the update is to bring all decoders up to date with the latest Viaccess Secure encryption type VO (Orca). 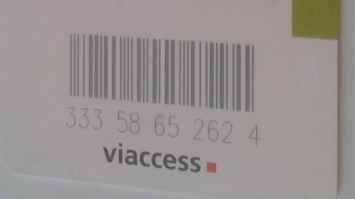 After 15th April support for the old encryption “viaccess” will be switched off. The cards expiring clearly state the issue PC5 also the old encryption type “Viaccess” , is now updated with “VO or Viaccess Orca” encryption, on the PC6 cards , which has been better able to stop the card hackers. 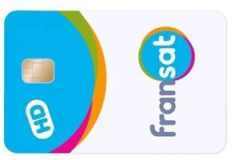 It looks like Fransat have decided to go for the same 4 year model as TNT , so in future all cards will need to be renewed on a 4 year basis. RMC is now live on Fransat, easy to activate and no contract. You can buy just one month, try it out and purchase 1,3 or 12 months if you like it. Super Sports bundle, English Premier League, Champions League, French Ligue, Bundesliga, Formula One, tennis………. 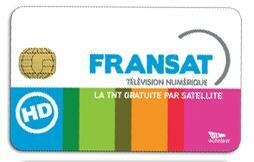 Fransat and TNT are the most popular French services , now easily available in great quality HD over satellite. No buffering problems like iptv, always available and not a huge dish. 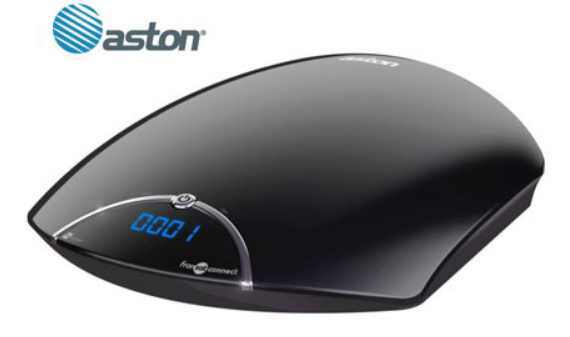 Yesterday I installed the latest version of the twin tuner Fransat box from Aston – the Maya twin connect. Surprise surprise ! 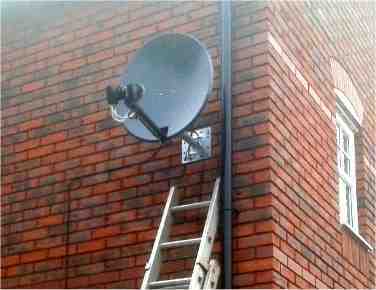 The new box has the multistream tuners fitted and the Italian channels from Eutelsat came through just fine. I did the quick tune procedure straight out of the box and the Italian channels were available in the bouquet list. Rete 4, Canale 5 and many more…. Economies of 190 million Euros by the end of 2022 have been set for French Public broadcasting. The cuts, fall mainly on France Televisions (160 million Euro) The first victims will be The Overseas Channel France Ô currently on Channel 27 and France 4 which will be removed from the TNT line up, during 2019. Younger viewers are moving to online video and web based entertainment, the focus groups report , headed by The Minister of Culture Françoise Nyssen who presented the plan back in July this year, its first tracks to reform the public broadcasting, including the strengthening of regional programs or the switchover of France 4 into an all digital format. Bad news for most UK viewers, used to having France 24 news ( in French) . Sky has stopped broadcasting the French language version of France 24 although the English version is still on. So from next year 2019 it will only be on OTT ( iptv ) so unless you have a suitable (Vision) Android box or smart tv it won’t be available for you. and Virgin will stop in January. Does it mean we don t have this channel anymore ? 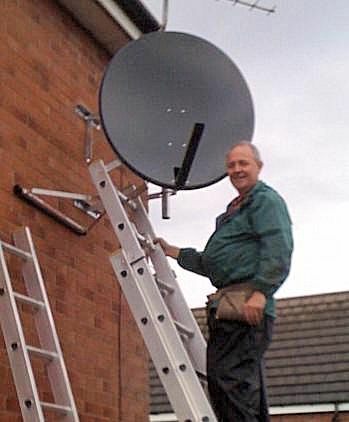 Well if you go for TNT the service from Astra 1 satellite, then its easy, even if your Sky service is the latest SkyQ , I can provide a dish that does both. This ONLY applies to customers having the popular TNT Humax model, TN5000HD. Suite à une mise à jour vous avez perdu les signaux de votre décodeur TN5000HD. Afin de pouvoir récupérer la personnalisation et par conséquent les signaux, merci d’allumer décodeur et téléviseur, et rester sur la chaine 7 ARTE durant 30 minutes. Merci de nous excuser pour la gêne occasionnée. My thanks to Benoit for finding this and letting me know. 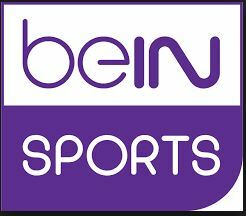 If you currently have BeIN sport with your Fransat pack, it is important to upgrade your software NOW! This should be done before the end of April 2018. In order to fight even more efficiently against piracy, beIN Sport decided to pair cards to receivers or CAMS, while upgrading to high secure CW64bits. By the end of april 2018, we’ll have to confirm the Chipset ID of the equipment used with the smart card. This information has to come along the brand and model of the receiver or module. The Chipset can be found on the backside of the modules (Neotion & Smit), or for fransat receivers, by consulting the corresponding menu. How to get the chipset_id ? After 18 months of talks to agree fees, between TF1 and Canal+ , a stalemate has been reached and Canal+ will now cease to carry ie broadcast the TF1 channel. TNT sat and Canalsat are both affected, so don’t worry, your receiver and card is not at fault. The TF1 group includes the channels TF1, TMC, TFX, TF1 Séries Films, LCI and their associated services, so expect that these channels will not be back on air until an agreement is reached. Previously the TF1 group provided the services free, but now want to charge a fee. Canal plus is refusing to pay their fees and it has sued the TF1 Group before the Paris Commercial Court to contest its claims. In 2017 it filed an appeal with the Conseil d’État against the CSA’s decision to simplify the renewal of the TF1 agreement that the latter had announced its intention to change its method of financing. TF1 is accused of abusing its power, it was granted the national frequencies and number one slot in French tv public domain and extensions for all its other channels. Plus as it enjoys these benefits and has regulatory advantages specific to free channels re the broadcasting of big sporting events for example the Football world cup. Canal Plus are contending that it is the viewers who will suffer under this unreasonable demand. The French ministry of culture has demanded that Canal+ resume its distribution of TF1 by TNT satellite as there are at least one and a half million French households which can only view the channel by satellite. Viewers in France who receive via aerial ( terrestrial ) meanwhile have seen TF1 move from its regular no1 channel to number 51 as standby frequencies are brought in to fill demand while the broadcasters fight it out. The process of updating the encryption used on the standard Fransat HD cards comes to an end in December, it has been in progress since May. You may be faced with a blank screen now or soon, the process of updating the cards has actually been going on since may 2017. For newer cards ( 05 type or 06 type ) all that is required is to take it out and re-insert, the process will then automatically update it and viewing usually starts soon after. For older ( 04 type ) cards , you will have to purchase a new card, as these are now incompatible with the changes. On the Eutelsat ( Fransat) Satellite frequency is 11595 s/r 29950 HD it is also FTA. Certainly Mr Macron, outspoken critic of RT during his election campaign will have more to say on RTs reporting, especially on the RT website…. keep watching! Oh Dear, more bad news! for all those with FTA ( free to air) receivers, your favourite channels France 2, 3 and 4 are to finish in mid November this year. The announcement came at the end of October, bringing to an end the free reception of these channels going back to the analogue transmissions pre 2011 and to TPS back in 2002 . The channels will go between 16th and 22nd of November 2016. 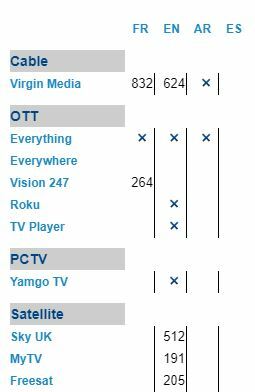 So, if you currently rely on these Free channels from Eutelsat 5w ( formerly known as Atlantic Bird 3 ) what can you do? The solution if you just require French channels, would be to purchase a Fransat HD receiver. If you require multi language reception, for example Italian, Spanish, German …. as well as the French channels, it will certainly be more difficult, as the current cam units are NOT suitable for STB ( set top box ) type receivers, but will work in some recent tv receivers. Due to piracy the encryption has been upgraded, due to rights issues the encryption now includes cam functions, most importantly recordings. The result is, they have made it as hard as possible to use anything but an original Fransat box. To a degree, the Fransat receivers can be used to tune in other satellites, but organising the resulting channels is very limited. Some STBs from Fransat are better than others and I’ll be testing out the various models and reporting here as time goes on. 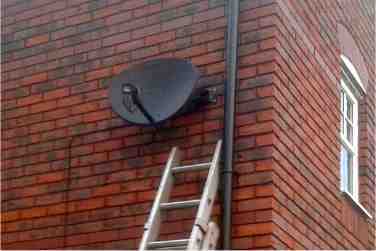 The Humax for example is looking like the best so far. One point to watch is firmware/software updates. Like Skyboxes, updates completely wipe out any customisation you have made to your Fransat box, so its important to make a note exactly how you retune , to gain back your Italian or Spanish etc. after the update has been completed. This generally will come down to noting which port on your dish switch ( diseqc switch) is connected to which LNB. Once that has been set up, tuning ” recherche globale” is fairly easy. Use the favourite selection system to store the non french channels. Engineers at Fransat have found the mysterious no-sound problem, only on the France 5 channel over the last few weeks, details are not available but it has now been rectified. Thanks to the few customers who emailed in about this.